Carbon tax | PRICE CARBON NOW! 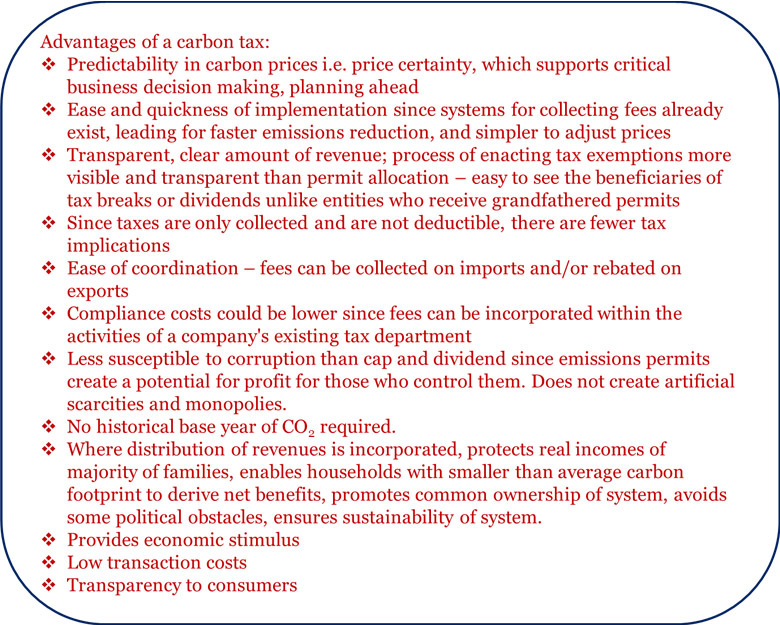 Four other features of carbon tax are noteworthy for a successful implementation including broad coverage, revenue neutrality, protection of families, and phased implementation.5,6 And more importantly, the carbon fee should increase each year at a rate that will enable us to meet set emission reduction targets. In the absence of appropriate measures or design, a carbon tax is expected to be regressive in nature meaning that it disproportionately affects the poor and low-income households because they spend a larger proportion of the income on energy. This can be eased by providing tax breaks or dividends to individuals and households. to provide dividends to households as advocated by the Citizens Climate Lobby.